Like a fine wine this is a basil with character that lingers. The foliage with its wine-red veins encircled by an emerald-green border is a visual delight to the eye. So rich is the visual complexity that this is a basil one needs to appreciate up close, in pots on a windowsill or in a table centrepiece. 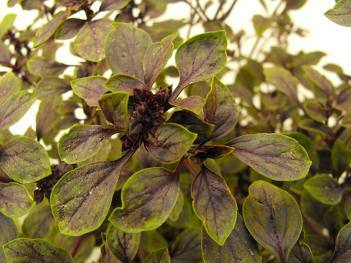 The leaves and overall size are smaller than standard sweet basil. Its growth habit is compact but not densely so like bush basil. RICHTERS EXCLUSIVE. Emerald Wine is a trademark of Richters; all rights reserved.